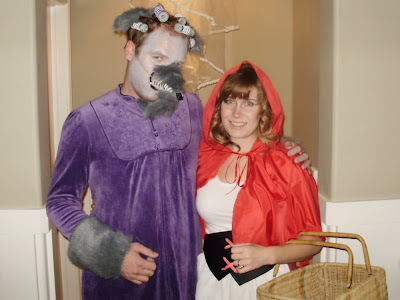 Tutorials for both Little Red Riding Hood and The Big Bad Wolf below. Need a last minute costume, but don't want to spend $50 on a cheapo from the costume store? Red Riding Hood: $1.50, 20 minutes. I bought a $1 yard of red fabric from Wal-mart and thought I could just drape it over my head. 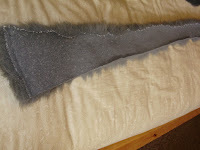 It looked all wrong so I searched the internet for how to make a cloak. 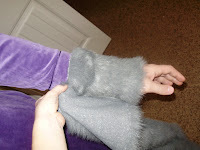 I found cute ideas like this one from Martha Stewart and these too, but I didn't want to sew! I didn't want to spend any time at all! Fortunately, I learned at least one thing from these...It needs to be a semi-circle, not a square. Don't even worry about cutting a hood pattern and sewing!! 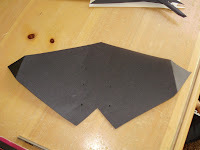 Step 4 (belt/corset): Take a piece of black cardstock and cut in the shape shown below, then poke 8 holes (4 on each side) down the center for lacing. 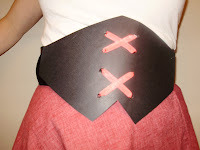 Step 5: Lace the red ribbon like tying a shoe, then put on an old black belt (or black ribbon tied around you) and staple the paper corsette on the front! No one could even tell it was paper the whole night! 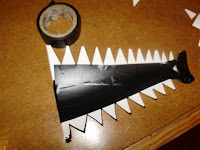 You could use hot glue instead of staples, and it might be more sturdy. Your done! Just put on some tights and shoes and do your hair however. I used a basket as my purse. You could just wrap all your belongings in another tea-towel so they aren't all visible. Have fun! I knew he needed a snout and I was at work when making it (our cafe) so the cup-snout was born. 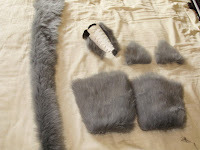 Step 4: Using the cup parts, trace a pattern on the back of the fur and cut the fur out using an exacto knife (if you use scissors the fur will look funny and you'll have fur everywhere.) 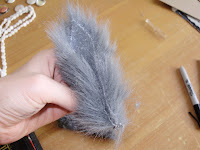 The just staple the fur on top and bottom of the snout. 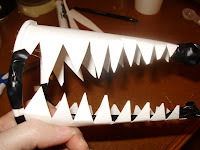 Strap a rubber band around the jaw so you can put it around the head, and your done! 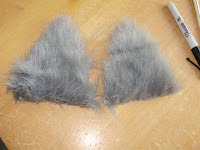 Cut 2 triangles (with x-acto knife) with the fur direction going toward the top of the triangle. Then just fold them in half at the bottom and bobby pin them in the hair (secured with curlers on either side) or pin to a night cap. 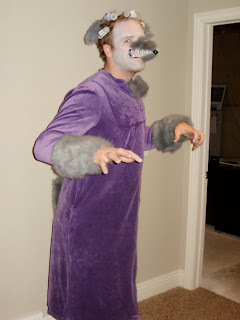 My wolfs granny nightgown had really short arms for him, so we put fur on the arms. You could also do the legs and then put on granny slippers. Measure around the arm and mark. 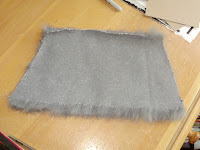 Then cut out the piece in a slightly belled shape (more room to move hands around), staple (or hand stitch for a more secure hold) the ends together and slip over arm stuffing ends into the sleeve. 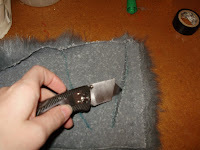 Just clip the short end of your fabric and rip a long piece of fur (ripping won't cut any hairs so it wont get all over, so it's much better than cutting and easier than exacto knife). 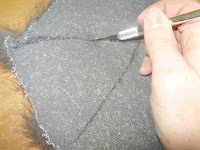 Then fold the piece and staple, then pin to your wolf's nightgown by the bum. You're all done! Just put the pieces on, and maybe a little grey make-up if you want. I'm totally down with this. You're a genius Melissa! Thanks a bunch, keep up being so damn awesome! Thank you Melissa. When my 6 yr old son came home from school and said he and his friends wanted to perform "Little Red Riding Hood" for the class, I know exactly where to go for a quick Red Riding Hood. You can see how it turned out at my Blog. wow that's amazing! 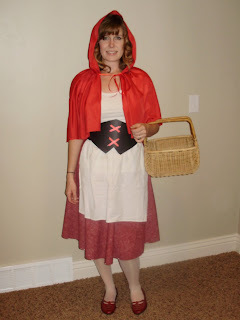 I wanna go to a costume party as little red riding hood and I was thinking my sewing skills are not that good and I'm not a huge fan of spending lots of money in things I probably won't use again. 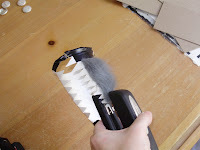 that is such an easy cloack to make!!! thank you! Ina Garten's Kitchen Have you seen the tour of Ina Garten's Barn? It was House Beautiful's Kitchen of the year in 2009. I just love how she mixes traditional and modern in the perfect way. So crisp yet comfy! Here's a little video with her about her kitchen.